A community for people affected by Cystic Fibrosis! CFCommunity is an online meeting place created by people with CF, for people with CF. We want to make it easy for those who live with CF to connect. But it’s more then just a community for us; those born with CF. CFCommunity is also meant for parents, siblings, partners, friends and those working with Cystic Fibrosis. What's your relationship with Cystic Fibrosis? Breaking news: Life with CF is different! Just kidding, you already knew that. There is always a bunch of stuff going on that only others with CF truly understand. CFCommunity is a place where we can hang out and talk about all the things that make life with CF different/awesome/lame/special. Hanging out online is not as good as throwing real-life rave parties across the world, but sadly that plan was scrapped early in our brainstorming process (segregation, pseudomonas blablabla). So we wasted blood, sweat and salty salty tears creating an online meeting place where we would like to hang out and meet others with CF. An international community developed and maintained by us; the Cystic Fibrosis community. We do not want to replace all the awesome existing CF causes and communities out there, we want to bring them together for you to find! On CFCommunity you can create your profile, start a blog, talk to others with CF and share pictures of your cat nebulizing(that is a joke. do not actually do that!). It is just for people affected by CF and we have made it easy to find and connect with people in similar situations as you. We hope to see you on CFCommunity soon! CFCommunity is not just for people who have CF. We have also made it for you; someone who loves someone with CF. A (grand)child, a sibling or your partner, we want to make it easy for you to connect with others in the same situation. Every person who becomes a member of our community fills in their relationship with CF. We use this information (along with your location and age) to let you easily search for and connect with people on CFCommunity! By joining our Discussion Groups you can talk about specific subjects in-depth and in private. Or if you need further support or want to stay up to date about all the medical news, our Causes page lets you easily find and connect with all the CF related initiatives out there! By creating a page for your cause on CFCommunity you can share news, post updates, brochures and connect with the people in our community. If you currently manage a Facebook Page for your cause you get the idea! With CFCommunity we are not trying to get in the way of any of the existing CF related causes. It is our goal to make it as easy as possible for our community members to find and follow the causes that are important to them. Through your cause page you can easily inform your fans by displaying news from your website, listing your upcoming events and much more. Your Cause will also be listed in our Causes directory where our community can search for causes based on location, language and goals. The end result? More easily accessible information for people with Cystic Fibrosis across the globe! Creating a private patient group for your hospital on CFCommunity is a great way for you care team to stay in touch with your patients. If you currently manage a Facebook Page for your hospital you get the idea! With CFCommunity we strongly believe that Facebook is not suited for your patient group. Whilst Facebook is a convenient way to share information with your patients, sensitive data is used by Facebook to collect data on your patients and target them with advertisements constantly. They run a business based on selling valuable data to external parties. This makes us very sad monkeys. That’s why we’ve spent a lot of time building our Hospital Directory. Every hospital can create a private discussion group for it’s patients where they can hang out, ask questions and find important information provided by your staff (like documents or brochures). The Group Administrator can easily invite patients via email or accept/reject members based on their CFCommunity profile! Interested? Our documentation and team of volunteers are here to help you get started!. Your Newsfeed Everything new in one place. Because sometimes people get a bit crazy with their updates (Yes we are looking at you Grandma CFChimp. Those 2000 pictures of your grandkids are just lovely), you can filter your newsfeed to only see whatever has your interest. Only want to see new blogposts from your friends? No problemo. Just want to see the activity in your private discussion group? We won’t stop you! Oh and we hate advertisement and other useless stuff (we’re looking at you Facebook). You can use our awesome search options to quickly find people in similar situations as you. You can get as specific as you like! For example you could search for people who speak Dutch, are above 20 years old and have experience with something you’re curious about! Once you’ve found someone you’d like to connect with simply send them a friend request and you can chat with them directly via our “MonkeyMessenger” or send them a private message! Groups Create or join groups that matter to you. When you create a group you can choose between different privacy levels (public or hidden) and even decide if you want to approve members before they can enter your group. You can also create a group that can only be joined by people in the same situation as you. So if you have CF you can create a group that only people with CF can participate in. We hate segregation as much as you do, but sometimes it’s nice to have a secret clubhouse right?! Join our community of fellow bloggers and create your own blog on CFCommunity! Your blog is linked to your profile and as soon as you publish your latest masterpiece, your friends will see your post in their newsfeed! Or maybe you want to use your blog to showcase your art. Or a video blog.. or.. well we’re sure you can come up with something cool! To help you get started we have a bunch of pre-made designs you can choose from. Already have a website which is world famous? That’s cool too! Like your site to your profile and all your new posts will be posted to your profile. Sweet! There are many amazing CF causes out there, and they are doing great things for people with CF. We want to make it easier for them to be found and for you to stay updated about the awesome work they do. This is why we creaetd the Causes Directory where we try to list all the CF related causes across the world. A cause page can be created by any CF related cause or organisation. Once you decide to follow a cause you will receive updates from them in your newsfeed. If you own or work for a cause you can use your cause page to stay in touch with the CF community. There is a lot of cool things you can add to your cause page, and you can read all about that here! Talking about CF is often a deeply personal thing and sometimes you might want to talk about things that are only meant for those who can truly relate. 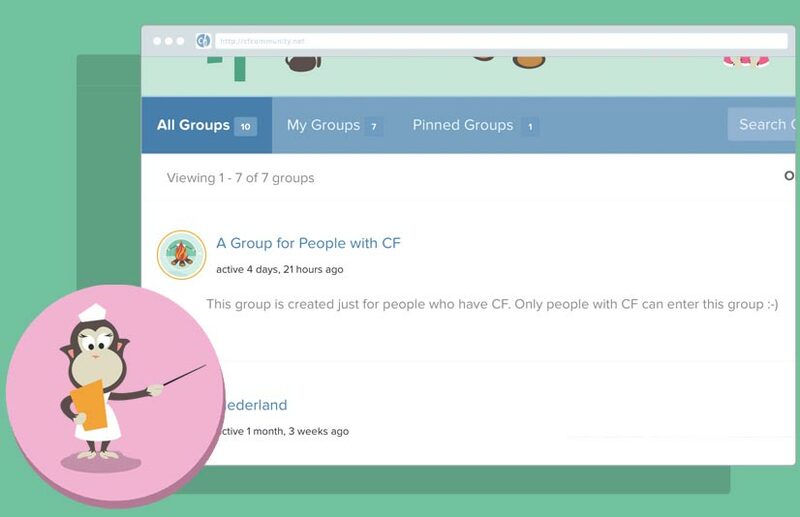 For example you can create a private group only accessible for people with CF! Or if you’re a parent you can do the same but make your group only accessible for other parents. And we’ll respect your privacy more than anything. We’ll never run advertisements or share your data with anyone. Super Duper Mega Pinky Promise. And much more... We're busy monkeys! Our community is always creating! Whilst you’re reading this our community members are busy adding videos to our CF Video site. 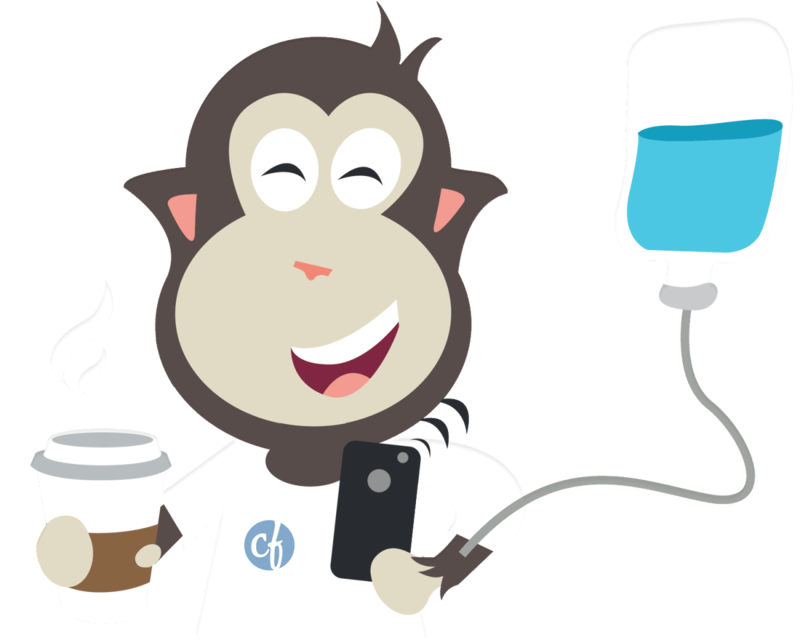 And our CFChimp is refining the recipe of his favorite Banana Cake on the CF Chef Site. We love creating sites in our network that are useful for the community! How about a medicine database where you can leave your experiences with certain meds and treatments? Or a site where you can ask and aswers CF related questions anonymously? We got plenty of ideas for the future. Have a cool idea for a site? Simply get started! 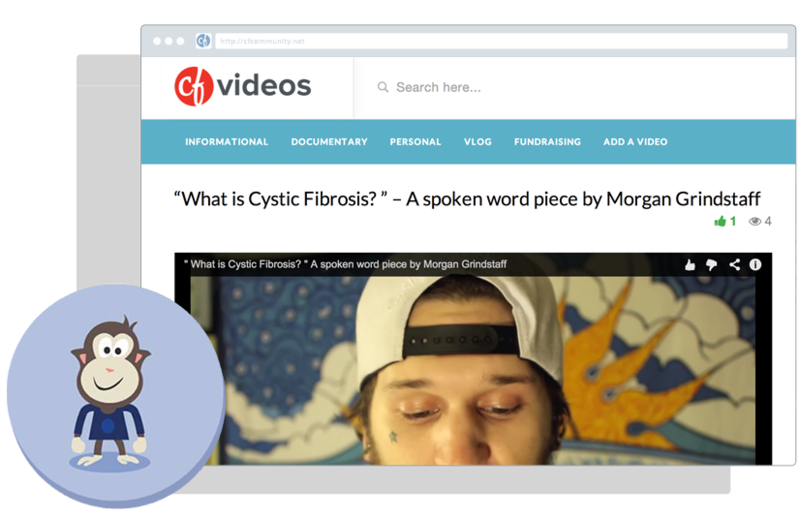 What is Cystic Fibrosis and why is CFCommunity needed? People with Cystic Fibrosis are not allowed to have contact with one another. It increases the chance of lung infections and has the potential to reduce life expectancy. Now imagine that thousands of others also share this genetic disease but you won’t ever be able to meet with them in person. You won’t be able to get together to share stories, a shoulder, a helping hand, a hug, or build a community of support and encouragement. Online, however, we can interact and engage as much as we want. Online we can create a community and a support network. Online we can make friends. Being around people who truly understand you is important. This realisation is what sparked our ambition to create something for us; the Cystic Fibrosis community. This is why we created CFCommunity. CFCommunity is 100% dependent on donations! We have managed to start our dream project thanks to many donations from friends, family and people affected by Cystic Fibrosis all across the world. We are now an officially registered cause in the Netherlands and any donation for our cause would be amazing. By supporting CFCommunity you can make a difference for those who live with CF.